What is a Michelin Bar? The Kyoto National Museum gallery features paintings from the Kamakura period and are based on paintings from the Song (960-1127), Yuan (1271-1368), and Ming (1368-1644) dynasties. They were developed in the 13th century but only became popular in the 15th century Muromachi period. The section was entirely landscape pieces that together made up the Eight Views of the Xiao and Xiang Rivers. Each piece was painted with mostly black ink and while the styles between painters differed, the pieces still retained the quality of a set of works. When trying to look for the qualities that made them comparable, I remembered the blurb that was written about the paintings in this exhibition: “Almost none of the Japanese artists painting these scenes had actually seen the Xiao and Xiang Rivers flowing into Lake Donting. Instead, they based their compositions on prototypes by Chinese artists, to which they added elements from their surrounding scenery and from their imaginations.” The museum makes a great effort to differentiate the Chinese set of the Eight View of Xiao and Xiang Rivers and the Japanese set as two different entities. However when looking at the original Chinese paintings is it possible to tell the difference between the two? Were the Chinese paintings used as prototypes to work off of, or were they copied en masse by famous Japanese painters. At what point do we draw the line that separates inspiration and plagiarism when it comes to painted art? Japan has a history of taking things from the Chinese and adapting it (whether it be slightly or greatly) to fit the Japanese aesthetic. Do these paintings reflect each other in the way that Kanji and Hanzi (original Chinese characters) do? Or is it more like the Japanese adaptation of Chinese ramen, where almost everything is changed? In order to answer these questions I compared Japanese landscape ink painting to that of the Chinese and tried to decipher whether the Japanese style is truly it’s own art form. When trying to find a link between the Chinese and Japanese ink paintings, I traced the connection back to the art produced in the Nara and Heian periods. At this point in time there weren’t any works that I could find to compare, but Tanaka Ichimatsu writes: “ The works produced by the artisans of this age such as the Horyu-ji murals and the Shosho-in treasures, exhibit a uniformity of style that has an international quality about it… When we consider the various artistic styles of this period, we discover a strong coherence and universality that in fact pervaded the entire Orient- rather than individual characteristics of a single nation of race. A comparison of T’ang art with that of the Nara period in Japan reveals many works so similar that it is extremely difficult to discern their true origin. In seeking the explanation of this similarity, we must not overlook the role of the foreign artisans living in Japan.” These foreign artisans who lived in Japan made up the majority of artists selected to produce paintings for the aristocracy. These painters then made up a bureau that transformed during the Heian period into the Edokoro (Painting Office). This Painting Office was part of the imperial court and controlled the painting activity through the Nara period and a great majority of the Heian. The reason why it is important to note the artistic history between the two rival nations before comparing landscape paintings is because we are trying to find out when the Japanese developed their own unique aesthetic. While a large majority of the artists that produced works from the 6th to 8th century were from abroad, they were cultured by the Japanese milieu and were able to influence native Japanese artists. The types of paintings produced at this time were separated into two separate categories: kara-e (literally Chinese painting) and yamato-e (literally Japanese painting). While kara-e dealt with Chinese themes, the yamato-e had a completely Japanese subject matter. This Chinese influence that exhibited itself in Japanese ink paintings was prevalent until the late Heian period (897-1185). Before this period the majority of Japanese paintings had been kara-e, and very few yamato-e works existed. However during the Heian period the kara-e style was transformed into a style that was distinctively Japanese, and the differences between the yamato-e and kara-e were blurred. Tanaka writes: “The island nation of Japan, which had formerly been the eastern reach of the cultural sphere centering on Ch’angan and Loyang, now removed itself from T’ang universalism and created its own separate cultural and artistic world… The art that Japan had been adopting from the continent had at last been assimilated, and the opportunity to create a more indigenous culture was at hand.” Since the Japanese are believed to have distinguished their style from the Chinese style during the Heian period, we should notice a uniqueness in the overall aesthetic with the landscape paintings during the Muromachi period (1336-1573). The first two pieces I will compare are by Japanese artist Sesshu, and Chinese artist Yü-chien. 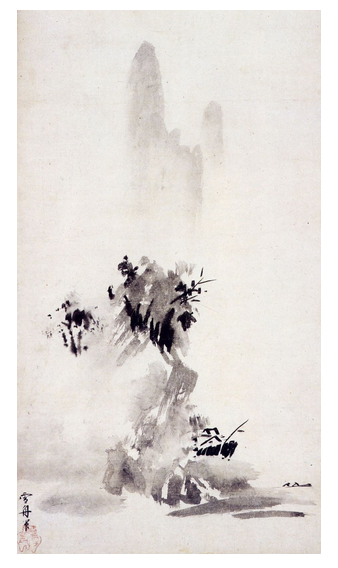 The piece by Sesshu is tilted Haboku Landscape, it is ink on paper, its dimensions are: height, 149 cm; width, 33 cm, and it is dated at 1495. The owner of this piece is the Tokyo National Museum. The piece by Yü-chien is titled Mountain Market In Clearing Mist and it is from the Eight Views of Xiao Xiang. It is ink on paper and its dimensions are: height 33cm, and width 84cm. it was painted in the Southern Sung dynasty. The reason why I chose to analyze and compare these two pieces is multifaceted. 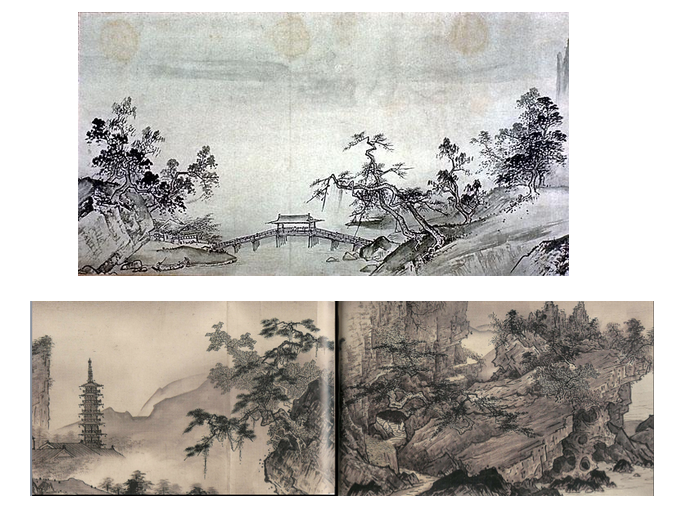 They are both from around the same time period, the Chinese painting being only about a century or two older. They also both have houses depicted along the mountain. Both paintings illustrate distinctive peaks and the opacity of black is varied. However the most import reason I chose to compare these two was because of the abstract and minimal styles used in both. The first thing to take note of is the name of Yü-chien’s piece. Each of the Eight Views of Xiao Xiang are given a name that loosely defines what is pictured in the scene. Ortiz writes: “Furthermore, all the titles are less descriptive of the geography of Xiao Xiang than evocative of the atmospheric impressions characteristic of the region. The images that match these poetic titles are difficult to visualize since their inherent subject matter is the expression of an inexplicable feeling, a sense of mystery conveyed by the recollection of memories. Those memories are the historical and aesthetic references to the Xiao Xiang.” Once we recognize the intentions of Yü-chien, we can further understand his design. The Chinese painting attempts to make use of its width by depicting the ridges of the mountains in a semicircular shape. While we can see faint outlines of the mountains in the paintings upper region, the foreground of the painting is riddled with heavy brushstrokes. These heavy brushstrokes stop at the middle of the backwards “C” and lead our eyes to a light trail of brushstrokes that utilize the otherwise untouched right portion of the piece, counterbalancing the Chinese poem written on the left. The houses depicted clearly are incredibly small and they are created with 2-4 strokes each. The brushwork used to define this painting style is referred to as “boneless,” the Chinese term being mo-ku-hua and the Japanese term being mokkotsubyō. This painting style devoids itself of conspicuous linear structure, which make up the bones in a painting. While still grounded in realism, a painter could “transfer an intuitive vision to the pictorial surface” by painting without regard to outline and form. This concept held true in my case, and I was able to intuitively imagine the houses as well as the mountains peaks and valleys. I was able to understand his grand design and the painting clicked with me after a couple minutes of rumination. The Japanese painting is vertically focused instead of horizontally focused and it makes use of the “extra” space in a somewhat similar manner. While Yü-chien utilized faint yet noticeable markings, Seshu uses a ghastly silhouette of a peak in order to fill the space. The special thing about Sesshu’s is that it not only fills the space, but also gives the picture a great depth; as if we are peering far behind the mountains that occupy the foreground. The level of abstractness is even greater in Sesshu’s and the opacity of the different strokes don’t quite make sense realistically. In Yü-chien’s the boldness of the strokes grow fainter as we move around the crescent shape which gives us a concept of depth; the mountains closest to us being darkest, while the farthest being lightest. Sesshu throws away this technique and paints all of the houses no matter what their position in the painting with bold strokes. The perception of depth is gauged by how abstract the houses become in the painting. While the homes on the bottom right are the most clear, the ones towards the top of the mountain are difficult to describe as such. The reason we can label them as houses is because he uses the same technique when he painted the ones below. The houses off to the left of the painting are barely reminiscent of houses and seem to float in midair. The reason for their great level of obscurity is because the mountain on which they are perched is far away enough from the viewer to not be seen, or even painted. Sesshu studied under Shūbun, the founder of the Chinese style of suiboku ink painting in Japan, and his work displays a great deal of similarities to Yü-chien. However Sesshu in fact separates himself from the Chinese great by utilizing his own techniques and applying his own respective philosophy to his work. While the subject is the same, the content is quite different when you look closely at both works. When it comes to pieces displaying this level of abstraction, it is safe to say that there is a significant difference between the two artists and countries. The final two pieces that I will compare are by Xia Gui and a different piece by Sesshu. The piece by Xia Gui is a section from the Landscape Scroll and it is ink on paper. The dimensions of the scroll are: height, 43.6 cm and length 106.6 cm. It is dated back to the Southern Sung dynasty, twelfth to thirteenth century, and is part of Nagatake Asano’s collection who resides in Tokyo. The piece by Sesshu is a section from the Long Landscape Scroll. It is ink on paper, and the dimensions of the scroll are: height 40 cm, and length 1807.5 cm. It is from 1486 and owned by the Mori foundation in Bofu of the Yamaguchi Prefecture. The reason why I chose to analyze these two pieces together was because of the way the paintings are structured and their use of focal points. While the painting by Xia Gui has only one focal point, the bridge in the middle of painting, Sesshu’s has two, the pagoda, and the sea (not pictured.) Both paintings also discard the boneless style and make use of concrete lines and descriptive shading based in reality. The trees also are drawn similarly and reach towards the focal points with roots that seem to connote movement. The painting by Xia Gui feels open, and is distinctly separated into three parts. The left and the right sections are occupied by trees that reach towards the the bridge in the middle section. While the right section of the painting contains trees that stand completely upright, there is a house on the left section that works to ground the section just as the rooted trees do. Both left and right sections instill a feeling of yearning to cross the bridge but also have aspects of stability that almost nullify that feeling. The piece is perfectly balanced which adds to the overall serenity that is manifested through the placid river that expands smoothly into the backdrop. The Japanese painting by Sesshu is harder to visually separate into parts but still utilizes two focals points. The pagoda stands tall a great distance from the mountains that occupy the foreground but still retains a similar opacity. While the trees still reach towards the pagoda, Sesshu utilizes a shading technique to prescribe even more of a three dimensional feel to the painting. The trees on the right side of the painting do not reach towards the ocean but instead stretch in different directions, which make it harder to prescribe the painting sections. Instead of trees, he makes use of the boulders on the beach that get smaller as we get to the ocean in order to depict “reaching” towards the focal point. The body of water in Sesshu’s painting still has an aspect of tranquility to it, but the stillness is broken by the waves that he draws on the outskirts of the painting with strong dark outlines. While the Japanese and Chinese landscape ink paintings appear strikingly similar at first glance, they are two completely different entities. While their content is similar, the techniques are used in different ways which show the difference of aesthetic between the two countries at that time. When the Kyoto National Museum says that the Chinese paintings of Xiao and Xiang were only prototypes they weren’t attempting to defend the work of the Japanese painters, but only give rightful credit to the works that inspired an incredible art form. Kanazawa, Hiroshi. Japanese Ink Painting: Early Zen Masterpieces. Tokyo: Kodansha, 1972. Print. Ortiz, Valerie. Dreaming the Southern Song Landscape: The Power Of Illusion In Chinese Painting. Boston: Brill, 1999. Print. Tanaka, Ichimatsu. Japanese Ink Painting: Shubun to Sesshu. New York: Weatherhill, 1972. Print.